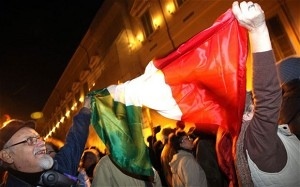 Crowds gathered outside the Italian presidential palace after Silvio Berlusconi resigned on Saturday. Europe’s scorched-earth policies have begun in earnest. The inherent flaws of monetary union have created a crisis of such gravity that EU leaders now feel authorized to topple two elected governments. As I long feared, the flood of cheap credit into Southern Europe and the slow death of Club Med industry by currency asphyxiation have together created such a dangerous situation for world finance that informed opinion is willing to turn a blind eye to EU sovereign trespass. Some even applaud. The Greeks were ordered to drop their referendum on measures that reduce their country to a sort of Manchukuo, with EU commissars “on the ground”, installed in each ministry, drawing up lists of state assets to be liquidated to pay foreign creditors. Europe had the monetary and fiscal means to contain the EMU debt crisis long enough for Greeks to give or withhold their crucial assent to this ultimatum in December. It chose – under German-Dutch pressure – not deploy those means. Instead it forced Greece to capitulate by cutting off an agreed loan payment. In Italy, the European Central Bank has engineered the downfall of Silvio Berlusconi by playing the bond markets, switching purchases on and off to enforce compliance with its written dictates (“La Lettera”), and ultimately allowing 10-year yields to spike to 7.45pc to drive him out. Europe’s president Herman Van Rompuy swooped in to Rome to clinch the Putsch. “Italy needs reforms not elections,” he said. We are not that far from use of EU judicial coercion, and then EU police power, and ultimately EU “border troops” – for those old enough to remember Soviet methods of fraternal assistance. Chancellor Angela Merkel tells us that peace in Europe can no longer be taken for granted, and she is right. Her own Gothic actions and her inflexible imposition of 1930s Gold Standard contraction and debt-deflation on Southern Europe is itself preparing the ground for Europe’s civil war (hopefully pacific), a rebellion by the South against the North.